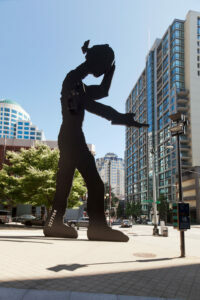 Jonathan Borofsky’s “Hammering Man,” 1991, at the Seattle Art Museum. Photo credit: Spike Mafford Photography. 23 years ago when I moved to Seattle with my husband, who grew up on nearby Vashon Island, I had some inkling of Seattle’s 1% for Art program, since the architectural office where we worked up until our move had received a commission to reimagine Piers 62/63 on the Seattle waterfront. Even in those days when the City of Seattle’s Public Art Program was not quite two decades old, it served as a national model of a robust effort to include the work of artists in the envisioning of the public realm. For someone who had mostly lived in Manhattan, the shock of the move (I’d only lived in apartments and now suddenly was in a house that came with a yard that needed tending and a feral cat that looked to me for food and, oh yeah, I had to learn to drive, too) was offset by all those things that make Seattle so “liveable” – its natural beauty, its easy access to outdoor recreation and its creative culture with its multiple art, theater and music venues. 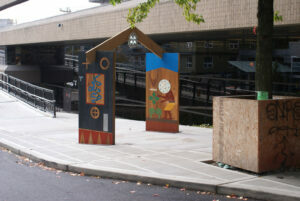 And that other unique aspect of Seattle – its abundant public art. Fast forward to 2013: I work at the city’s Office of Art & Culture, where we are celebrating the 40th anniversary of Seattle’s public art program. In 1973, enlightened city officials put in place what is known as the 1% for Art ordinance; they wanted Seattle to become a national leader in the fledgling field of municipally funded public art. Today, the city boasts more than 400 permanently sited artworks in public places such as parks, transfer stations (yes, at the dump), libraries, streets and bridges. Many community groups and other agencies followed suit, adding more artworks that you can find in just about every corner of Seattle. These projects create a sense of special place and enrich the viewer’s experience of the urban environment. “Snoqual/Moon the Transformer” by Roger Fernandes, 2012, on Lower Queen Anne Hill. Photo credit: Roger Fernandes. Michael Heizer’s “Adjacent, Against, Upon,” 1976, at Myrtle Edwards Park Photo redit: Spike Mafford Photography. Tony Oursler, “Braincast,” 2004. 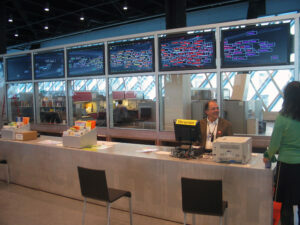 Located at the Seattle Public Library’s Central Branch. 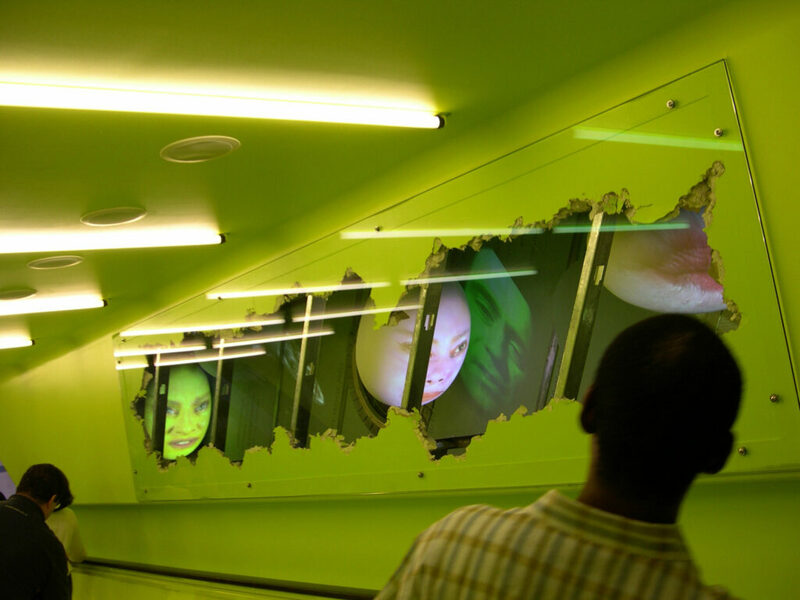 Photo credit: Tony Oursler. Native American carvings at Pioneer Place and Occidental Parks. George Legrady’s “Making Visible the Invisible,” 2004, at the Seattle Public Library’s Central Branch. Photo credit: Courtesy of the Seattle Office of Arts & Culture (unknown photographer). To give people an added sense of Seattle’s vibrancy, I recommend that visitors swing by Cal Anderson Park on Capitol Hill, the city’s densest neighborhood. In addition to being located near great shopping and eating, this park features something for everyone – playfields for organized sports (I’ve spent countless hours watching my kids play soccer at Bobby Morris Playfield), a tennis court that doubles as a bike polo court, children’s play areas and a wading pool, as well as gracious walking paths that wind among heritage trees. The centerpiece is a large water feature that was designed with the help of artist Douglas Hollis. Waterworks looks like a volcano with water pouring out of it and down through a runnel with diverters you can move into calm reflecting pools. In addition to all its other attractions, Seattle Center is loaded with artworks, from older to modern totem poles, large steel sculptures from the 1980s to bronze whales and sea creatures that children can play on and around. At South Lake Union Park, you can walk out onto the water – on Blanche, an artwork that floats like a dock on the lake next to the Museum of History and Industry (MOHAI). I haven’t even touched on the art in all the other corners of Seattle. Wander through Seattle’s many neighborhoods and you can find art in parks and community centers, at the fire station or the police precinct, on street corners and in the sidewalk, beneath your feet and above your head. Help us celebrate our 40th birthday by finding public art on your next trip through the city. Ruri Yampolsky is the director of the public art program for the city of Seattle’s Office of Arts & Culture where she oversees the city Public Art program, working to integrate the ideas and work of artists into the public realm and large-scale, capital construction projects.